The last few years have been a departure of my usual modus operandi in regards to climbing. I stopped focusing on competitions, and instead turned to climbing outside. Motivation. I’ve found that with grad school, which consumed exponentially more mental energy for me than undergrad, that I didn’t have the drive or mindset to compete at the level I was used to. What do I mean by competition mindset? Well, I think it comes down to a fundamental desire to perform and be the best (on plastic). Clearly, competition climbing is pretty mentally taxing. To be successful, this motivation needs to be present year round. It needs to fuel your training. Like climbing competitions, grad school is competitive, and so my focus on climbing changed. I began to see climbing as an outlet, rather than another area of my life to be competitive. These last two years I’ve been climbing outside more, drawn to the solace that being in nature can bring. With the seemingly endless supply of rocks to climb in Colorado, it’s easy to lose oneself in a plethora of hard projects! This spring, I’m looking forward to revamping my training program and finishing some unfinished business. If 2013 was the year of spreading myself thin on projects around Colorado, 2014 will be the year of checking those projects off the list. 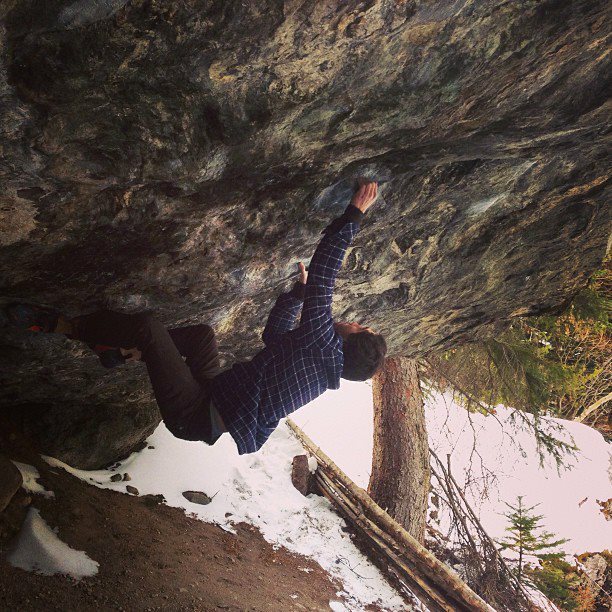 I have something like five V14 or harder boulder problems that I’ve invested considerable time and energy into. One of them, Paint it Black (pictured), may require a bit of specific/target training as the crux requires exceptional upper body strength and core tension. I also have unfinished business in Switzerland. A year and a half ago I spent the better part of 4 weeks during the summer on two problems (New Base Line and In Search of Time Lost) in Magic Wood. Thwarted by the summer heat and rain, this time will be different. Returning in during the right season will be key. Switzerland is an expensive venture, but the consequences of not going are severe (mental breakdown?). As you know, I love Switzerland. But I’m getting ahead of myself. Time to press the reset button. First on the list for 2014 is a short deep water soloing trip to Thailand. A much needed reprieve from the cold Colorado granite and graduate research. In preparation for trip, I’ve acquired a GoPro and waterproof case. This should make for some interesting footage. Any tips on how to secure a GoPro to your body without a helmet? Be on the lookout for one of my wacky videos in a few weeks! It’s interesting, looking back on the sections of this post regarding competition climbing, I subconsciously wrote it the past tense. As my life chapter on grad school begins to close (there’s light at the end of the tunnel! ), I feel the burning desire to excel again at competition climbing. I think it’s time to show up in both body and mind at competitions this year. ← Rob D’Anastasio: Climbing With a Job.